Multidrug resistance (MDR) in tumor cells is a significant obstacle to the success of chemotherapy in many cancers. The purpose of this research is to test the possibility of docetaxel-loaded poly (ε-caprolactone)/Pluronic F68 (PCL/Pluronic F68) nanoparticles to overcome MDR in docetaxel-resistance human breast cancer cell line. Docetaxel-loaded nanoparticles were prepared by modified solvent displacement method using commercial PCL and self-synthesized PCL/Pluronic F68, respectively. PCL/Pluronic F68 nanoparticles were found to be of spherical shape with a rough and porous surface. The nanoparticles had an average size of around 200 nm with a narrow size distribution. The in vitro drug release profile of both nanoparticle formulations showed a biphasic release pattern. There was an increased level of uptake of PCL/Pluronic F68 nanoparticles in docetaxel-resistance human breast cancer cell line, MCF-7 TAX30, when compared with PCL nanoparticles. The cytotoxicity of PCL nanoparticles was higher than commercial Taxotere®in the MCF-7 TAX30 cell culture, but the differences were not significant (p > 0.05). However, the PCL/Pluronic F68 nanoparticles achieved significantly higher level of cytotoxicity than both of PCL nanoparticles and Taxotere®(p < 0.05), indicating docetaxel-loaded PCL/Pluronic F68 nanoparticles could overcome multidrug resistance in human breast cancer cells and therefore have considerable potential for treatment of breast cancer. Cancer remains the leading cause of death worldwide. The global incidence and mortality of breast cancer remains high despite extraordinary progress in understanding the molecular mechanisms underlying carcinogenesis, tumor promotion, and the establishment of molecular targeted therapies . Although early detection and screening of breast cancer is associated with less invasive surgical procedures and may increase survival, the 5-year survival rate of metastatic breast cancer (stage IV) is still below 15%. Multidrug resistance (MDR) to anticancer agents remains a major barrier to successful cancer treatment. Thus, the development of effective therapies overcoming MDR against invasive breast cancer and particularly highly metastatic disease still remains a significant priority. Nanoparticulate delivery systems in cancer therapies provide better penetration of therapeutic and diagnostic substances within the body at a reduced risk in comparison with conventional cancer therapies. Nanoparticles could reduce the multidrug resistance (MDR) that characterizes many anticancer drugs, including docetaxel, by a mechanism of internalization of the drug , reducing its efflux from cells mediated by the P-glycoprotein . Nanoparticle distribution within the body is based on various parameters such as their relatively small size resulting in longer circulation times and their ability to take advantage of tumor characteristics. In comparison to conventional cancer treatments, the nanoscale of these particulate systems also minimizes the irritant reactions at the injection site. Nanoparticles and their use in drug delivery is a far more effective cancer treatment method than conventional chemotherapy, which is typically limited by the toxicity of drugs to normal tissues, short circulation half-life in plasma, limited aqueous solubility, and nonselectivity restricting therapeutic efficacy . Docetaxel is a poorly water-soluble, semi-synthetic taxane analog commonly used in the treatment of breast cancer, oval cancer, small and nonsmall cell lung cancer, prostate cancer, etc. Its commercial formulation Taxotere® is formulated in high concentration of Tween 80, which has been found associated with severe side effects including hypersensitivity reactions, cumulative fluid retention, nausea, mouth sores, hair loss, peripheral neuropathy, fatigue, and anemia [5, 6] and has shown incompatibility with the common PVC intravenous administration sets . In order to eliminate the Tween 80-based adjuvant and in the attempt to increase the drug solubility, alternative formulations have been attempted, such as liposomes , nanoparticles [8–10], docetaxel-fibrinogen-coated olive oil droplets . Among them, the nanoparticle formulation holds greatest promise for this purpose. The nanoparticles showed advantages such as more stable during storage over others. Moreover, such a colloidal system is able to extravasate solid tumors into the inflamed or infected site, where the capillary endothelium is defective [3, 4]. Nanoparticles serving in anticancer therapies may be comprised, in whole or in part, of various lipids and natural and synthetic polymers. Most commonly used synthetic polymers to prepare nanoparticles for drug delivery are biodegradable. Among the various biodegradable polymers approved by the US Food and Drug Administration (FDA), poly(lactide) (PLA), poly(d,l-lactide-co-glycolide) (PLGA), and poly (caprolactone) (PCL) are used most often in the literature. In the family of polyesters, PCL occupies a unique position: it is at the same time biodegradable and miscible with a variety of polymers, and it crystallizes very readily . A lack of toxicity and great permeability has already found wide use for PCL in medical applications . Pluronic F68 is a difunctional block copolymer surfactant terminating in primary hydroxyl groups. It is both water and organic solvent soluble. Poloxamers and poloxamine nonionic surfactants have diverse applications in various biomedical fields ranging from drug delivery and medical imaging to management of vascular diseases and disorders . In the present study, Pluronic F68 was incorporated into PCL as a pore-forming agent and drug-releasing enhancer. Previous studies by our group have demonstrated the amount of Pluronic F68 blended into PCL affected the microspheres morphology and controlled paclitaxel release . In addition, it has been demonstrated that Pluronic block copolymers interact with multidrug-resistant (MDR) tumors resulting in drastic sensitization of these tumors with respect to various anticancer agents [13, 14]. The key attribute for the biological activity of Pluronics is their ability to incorporate into membranes followed by subsequent translocation into the cells and affecting various cellular functions, such as mitochondrial respiration, ATP synthesis, activity of drug efflux transporters, apoptotic signal transduction, and gene expression. As a result, Pluronics cause drastic sensitization of MDR tumors to various anticancer agents including docetaxel, enhance drug transport across the blood–brain barriers (BBB) and intestinal barriers and cause transcriptional activation of gene expression both in vitro and in vivo [14, 15]. Furthermore, recent studies indicated that Pluronic F68 is a potent in vitro inhibitor of both P-gp and CYP3A4 . Thus, in this research we investigate the hypothesis that a novel docetaxel-loaded PCL/Pluronic F68 nanopaticles overcoming multidrug resistance (MDR) will achieve better therapeutic effects in docetaxel-resistance human breast adenocarcinoma MCF-7 cell line. In brief, docetaxel of purity 99% was purchased from Shanghai Jinhe Bio-Technology Co. Ltd, Shanghai, China. Polycaprolactone (Mn ~ 42,500) was obtained from Sigma–Aldrich (St. Louis, MO, USA). Cell Counting Kit-8 (CCK-8) was from Dojindo Molecular Technologies Inc., Kumamoto, Japan. ε–Caprolactone monomer with 99.9% purity was from Aldrich Chemical Co., USA. The monomer was further purified by vacuum distillation over CaH2. Pluronic F68 with molecular weight (Mw) around 8,300 containing about 80% poly (ethyl oxide) (PEO) segment and 20% of poly (propyl oxide) (PPO) segment was purchased from BASF, Germany. The Pluronic F68 was incorporated into PCL matrix in 10% of weight ratio as a molecular distribution, which would leach out in aqueous medium to leave microporous structure in the PCL matrix (Sun et al., 2006). Polyvinyl alcohol (PVA) (MW 30 000–70 000) was obtained from Sigma, Chemical Co (St Louis, MO). Acetonitrile and methanol used as mobile phase in high performance liquid chromatography (HPLC) were purchased from EM Science (ChromAR, HPLC grade, Mallinckrodt Baker, USA). All other chemicals were HPLC grade and were used without further purification. Millipore water was prepared by a Milli-Q Plus System (Millipore Corporation, Breford, USA). PCL/Pluronic F68 compound was synthesized by ring-opening polymerization as shown in Fig. 1; . Briefly, the terminal hydroxyl groups in Pluronic F68 molecules were capped with acetyl so that it became inactive and would not participate in the polymerization reaction of ε-caprolactone. The acetyl-capped Pluronic F68 was dissolved in ε-caprolactone monomer before polymerization so that Pluronic F68 was incorporated in PCL matrixes as a molecular dispersion instead of forming a copolymer. The polymerization was carried out at 140◦C under high vacuum for 24 h with 0.04% stannous octoate as catalyst. The nanoparticles were prepared by modified solvent displacement method as described previously . Briefly, 100 mg of PCL/Pluronic F68 compound and 17.65 mg of docetaxel were dissolved in 100 mL of acetone by mild heating and sonication. The mixed solution was gently poured into 50 mL of deionized water containing 1,000 mg of PVA under magnetic stirring. The emulsion was then evaporated overnight under reduced pressure to remove the organic solvent. The resulting suspension of nanoparticles was centrifuged at 23,000 rpm for 30 min. The pellet was washed twice with distilled water to remove free drug and PVA. The resulted particles were freeze-dried for 2 days. Docetaxel-loaded PCL nanoparticles and empty PCL/Pluronic F68 nanoparticles were prepared by the same method. In addition, the fluorescent coumarin-6-loaded nanoparticles were prepared in the same way except 0.05% (w/v) coumarin-6 was encapsulated instead of docetaxel. The nanoparticles were imaged by a field emission scanning electron microscopy (FESEM) system at an accelerating voltage of 5 kV. To prepare samples for FESEM, the particles were fixed on the stub by a double-sided sticky tape and then coated with platinum layer by JFC-1300 automatic fine platinum coater (JEOL, Tokyo, Japan) for 80 s.
The particle size and size distribution were measured by laser light scattering (Brookhaven Instruments. Corporation, Holtsville, NY 90-PLUS analyzer). Before measurement, the freshly prepared particles were appropriately diluted. Zeta potential of the docetaxel-loaded nanoparticles was detected by laser Doppler anemometry (Zeta Plus zeta potential analyzer, Brookhaven Corporation, Holtsville, NY). The particles (about 2 mg) were suspended in deionized water before measurement. The data were obtained with the average of three measurements. Drug content in the nanoparticles was assayed by HPLC (Agilent LC 1100, Santa Clara, CA, USA). A reverse-phase Inertsils ODS-3 column (150 μm × 4.6 μm, pore size 5 μm, GL science Inc, Tokyo, Japan) was used. Briefly, 5 mg particles were dissolved in 1 mL DCM under vigorous vortexing. This solution was transferred to 5 mL of mobile phase consisting of deionized water, methanol, and acetonitrile (50:45:5, v/v). DCM was evaporated in nitrogen atmosphere and the clear solution was obtained for HPLC analysis. The solution was transferred into HPLC vial after filtered through 0.22 mm syringe filter. The flow rate of mobile phase was 1 mL/min. The column effluent was detected at 230 nm with a UV/VIS detector. The measurement was performed triplicate. The encapsulation efficiency (EE) was expressed as the percentage of the drug loaded in the final product. The physical status of docetaxel inside the nanoparticles was investigated by differential scanning calorimetry (DSC 822e, Mettler Toledo, Switzerland). The samples were purged with dry nitrogen at a flow rate of 20 mL/min. The temperature was raised at 10 °C/min. Dialysis method was selected to examine the drug release in vitro. Briefly, 15 mg nanoparticles were dispersed in 5 mL release medium (phosphate buffer solution (PBS) of pH 7.4 containing 0.1% w/v Tween 80) to form a suspension. Tween 80 was used to increase the solubility of docetaxel in the buffer solution and avoid the binding of docetaxel to the tube wall. The suspension was put into a standard grade regenerated cellulose dialysis membrane (Spectra/Por®6, MWCO = 1,000, Spectrum, Houston, TX, USA). Then, the closed bag was put into a centrifuge tube and immersed in 15 mL release medium. The tube was put in an orbital water bath shaking at 120 rpm at 37.0 °C. At given time intervals, 10 mL samples was sucked out for analysis and replaced with fresh medium. In this research, the sink condition was maintained by the addition of Tween 80 and frequent replacement of fresh buffer during the in vitro release experiment. The newly collected samples were extracted with 2 mL DCM and reconstituted in 5 mL mobile phase. The DCM was evaporated by nitrogen stream. The analysis procedure was similar as for the measurement of EE. In this research, human breast cancer cell lines MCF-7 cells of passages between 26 and 31 (American Type Culture Collection, VA) were cultured in Dubelco’s modified essential medium (DMEM) supplemented with 10% FBS, 100 mM sodium pyruvate, 1.5 g/L of sodium bicarbonate, and 1% penicillin–streptomycin and incubated in SANYO CO2 incubator at 37 °C in a humidified-environment of 5% carbon dioxide. Then, docetaxel-resistance human breast cancer cells (MCF-7 TAX30) were created as described previously . Briefly, the cells were made resistant to docetaxel by short-term in vitro exposure to docetaxel for 1 h, which was immediately followed by washing of the cells several times with culture media, trypsinization, and splitting the cells for subsequent cell growth recovery. The cells were initially exposed to 10 nmol/L docetaxel increasing to 500 nmol/L for 1 h. After this point, the cells were exposed to 1 μmol/L docetaxel increasing to 30 μmol/L docetaxel for 24 h.
For quantitative study, docetaxel-resistance human breast cancer cells (MCF-7 TAX30) were seeded into 96-well black plates (Costar, IL, USA) of 1.3 × 104cells/well, and after the cells reached confluence, the cells were equilibrated with HBSS at 37 °C for 1 h and then incubated with coumarin-6-loaded PCL/Pluronic F68 nanoparticle suspension. The nanoparticles were dispersed in the medium at a concentration of 100, 250, and 500 μg/mL. The wells with nanoparticles were incubated at 37 °C for 2 h. After incubation, the suspension was removed, and the wells were washed three times with 50 μL cold PBS to eliminate traces of nanoparticles left in the wells. After that, 50 μL of 0.5% Triton X-100 in 0.2N NaOH was introduced into each sample wells to lyse the cells. The fluorescence intensity of each sample well was measured by microplate reader (GENios, Tecan, Switzerland) with excitation wave length at 430 nm and emission wavelength at 485 nm. 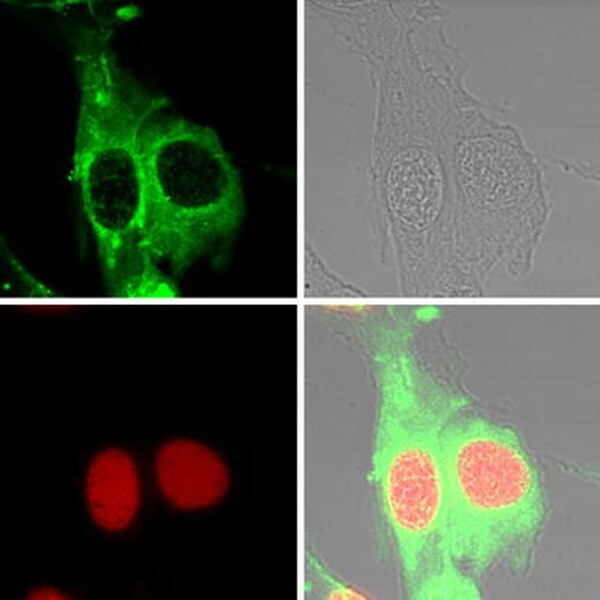 Cell uptake efficiency was expressed as the percentage of cells-associated fluorescence versus the fluorescence present in the feed solution. For the qualitative study, cells were reseeded in the chambered-cover glass system (LABTEK®, Nagle Nunc, IL). After the cells were incubated with 250 μg/mL coumarin-6-loaded nanoparticles at 37 °C for 2 h, they were rinsed with cold PBS for three times and then fixed by ethanol for 20 min. The cells were further washed twice with PBS, and the nuclei were counterstained with propidium iodide (PI) for 30 min. The cell monolayer was washed twice with PBS and mounted in Dako®fluorescent mounting medium (Glostrup, Denmark) to be observed by confocal laser scanning microscope (CLSM) (LSM 410, Zeiss, Jena, Germany) with an imaging software, Fluoview FV500. Cancer cell viability of the drug-loaded PCL/Pluronic F68 nanoparticles was evaluated by CCK-8 assay. CCK-8 is a kind of cell viability assay reagent with a higher sensitivity and a better reproducibility than MTT. Hundred μL of MCF-7 TAX30 cells were seeded in 96-well plates (Costar, IL, USA) at the density of 5 × 103viable cells/well and incubated at 24 h to allow cell attachment. The cells were incubated with docetaxel-loaded PCL/Pluronic F68 nanoparticle suspension, docetaxel-loaded PCL nanoparticle suspension, Taxotere®at 0.025, 0.25, 2.5, 10, and 25 μg/mL equivalent docetaxel concentrations and empty PCL/Pluronic F68 (PCL/F68) nanoparticles with the same nanoparticle concentrations of 0.25, 2.5, 25, 100, and 250 μg/mL for 24, 48, and 72 h, respectively. At designated time intervals, the medium was removed, and the wells were washed with PBS for two times. Ten μL of CCK-8 solution was added to each well of the plate and incubated for 1–4 h in the incubator. The absorbance was measured at 450 nm using a microplate reader. Cell viability was calculated by the following equation. where Abssis the fluorescence absorbance of the cells incubated with the nanoparticle suspension, and Abscontrolis the fluorescence absorbance of the cells incubated with the culture medium only (positive control). IC50, the drug concentration at which inhibition of 50% cell growth was observed, in comparison with that of the control sample, was calculated by curve fitting of the cell viability data. The results are expressed as mean ± SD. The significance of differences was assessed using Student’st test and was termed significance whenp = 0.05. PCL/Pluronic F68 compound with viscosity average molecular weight of 44,000 was successfully synthesized. Previous studies by our group have demonstrated that drug release rate was greatly enhanced by increasing content of Pluronic F68 in PCL matrix from 0 to 10%, but there was no further increase in release rate when the content of Pluronic F68 increased to 15% . Therefore, we decided to use the PCL/Pluronic F68 (90/10, wt/wt) matrix as the final drug carrier to fabricate PCL/Pluronic F68 nanoparticles. The nanoparticles were characterized in terms of mean size and size distribution, morphology, surface charge, and physical state of encapsulated drug. As shown in Table 1, the average size of PCL/Pluronic F68 nanoparticles was much smaller, and the particle size distribution was much narrower than those of PCL nanoparticles. Nonionic emulsifier, especially Pluronic F68, offered additional steric stabilization effect avoiding aggregation of the fine particles in the colloidal system . In this sense, Pluronic F68 may act as a coemulsifier in the fabrication process, resulting in smaller particle size and narrow size distribution. The drug loading level of docetaxel encapsulated in the PCL/Pluronic F68 and PCL nanoparticles was 10.02% and 9.76%, respectively. In addition, the results revealed that the drug encapsulation efficiency (EE%) of both nanoparticle formulations was almost the same and more than 65%. As shown by Fig. 2, the docetaxel-loaded nanoparticles (PFNP) observed by FESEM were spherical in shape, and their size was around 200 nm. The surface of nanoparticles appears rough and porous. As mentioned earlier, Pluronic F68 is both organic and water-soluble. 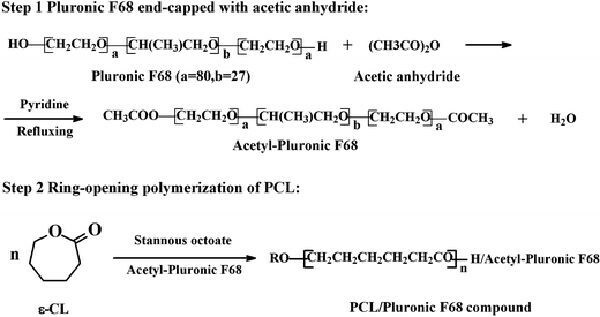 So the pores in the surface of PCL/Pluronic F68 nanoparticles could be attributed to the hydrophilicity of Pluronic F68. 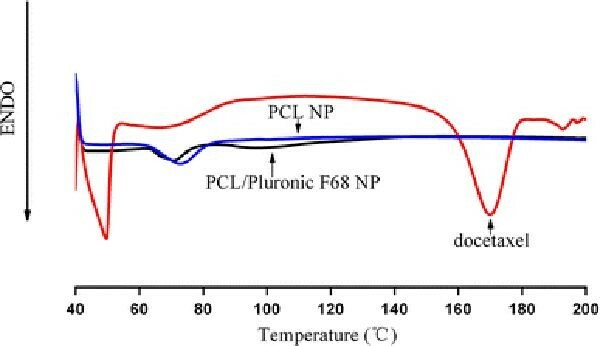 Pluronic F-68 leached out due to the water phase during fabrication process, therefore creating porous structure in the surface of the PCL/F68 nanoparticles . In addition, Pluronics adsorb strongly onto the surface of hydrophobic nanospheres [e.g. polystyrene, poly(lactide-co-glycolide), poly(phosphazene), poly(methyl methacrylate), and poly(butyl 2-cyanoacrylate) nanospheres] via their hydrophobic POP center block . This mode of adsorption leaves the hydrophilic POE side-arms in a mobile state because they extend outward from the particle surface. These side-arms provide stability to the particle suspension by a repulsion effect through a steric mechanism of stabilization, involving both enthalpic and entropic contribution [22, 23]. Zeta potential, i.e., surface charge can greatly influence the particles stability in suspension through the electrostatic repulsion between the particles. It is also an important factor to determine their interaction in vivo with the cell membrane, which is usually negatively charged. In addition, from the zeta potential measurement, we can roughly know the dominated component on the particles surface. The detection of laser Doppler anemometry showed that zeta potential of docetaxel-loaded PCL/Pluronic F68 nanoparticles was −12.5 mV, a great increase compared with that of PCL nanoparticles, with zeta potential around −48.7 mV. Since Pluronic F68 is nonionic, this surface charge increase demonstrated the presence of Pluronic F68 layer on the surface, which shifted the shear plane of the diffusive layer to a larger distance . However, high absolute value of zeta potential is necessary to ensure stability and avoid aggregation of particles. It thus could be concluded that PCL/Pluronic F68 nanoparticles were electrically less stable than PCL nanoparticles. DSC studies were performed to investigate the physical state of the drug in the nanoparticles, because this aspect could influence the in vitro and in vivo release of the drug from the systems. Figure 3shows the DSC thermograms of pure docetaxel, PCL/Pluronic F68 nanoparticles, and PCL nanoparticles. The melting endothermic peak of pure docetaxel appeared at 173 °C. However, no melting peak was detected for both nanoparticle formulations, evidencing the absence of crystalline drug in the nanoparticles, at least at the particle surface level. It might be hypothesized that the polymer inhibited the crystallization of docetaxel during nanoparticles formation. Therefore, it could be concluded that docetaxel in the nanoparticles was in an amorphous or disordered crystalline phase of a molecular dispersion or a solid solution state in the PCL/Pluronic F68 matrix after the production. Maintaining sink condition for poorly water-soluble drugs has been one of the difficulties in designing in vitro release experiments. In this research, the sink condition was maintained by the addition of Tween 80 and frequent replacement of fresh buffer during the in vitro release experiment. The in vitro drug release profiles of the docetaxel-loaded nanoparticles in the first 32 days are shown in Fig. 4. The initial burst of 35.57 and 47.01% in the first 5 days can be observed for PCL nanoparticles and PCL/Pluronic F68 nanoparticles, respectively, which is followed by an approximately first–order release afterward. 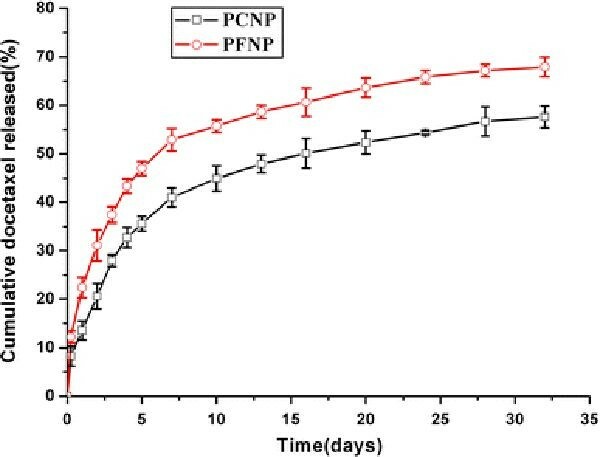 After 32 days, the accumulative drug release from PCL/Pluronic F68 nanoparticles was found to be 67.91%, which was significantly faster than PCL nanoparticles, which is 57.60%. The present studies confirmed our previous results that the amount of Pluronic F68 blended into PCL could facilitate drug release and affect the microspheres morphology . Thus, Pluronic F68 blended into PCL could also be used as a pore-forming agent and drug-releasing enhancer in nanoparticle formulation. It is clear that the therapeutic effects of the drug-loaded nanoparticles would depend on internalization and sustained retention of the nanoparticles by the diseased cells . Although in vitro and in vivo experiment could produce different results, an in vitro investigation can provide some preliminary evidence to show advantages of nanoparticle formulation versus free drug. Coumarin-6, a fluorescence marker, has been widely used as a probe for marking nanoparticles in cellular uptake experiment, because of its biocompatibility, high fluorescence activity, low dye loading (<0.5%, w/w), and low leaking rate, which is used to replace the drug in the nanoparticle formulation to visualize and measure cellular uptake of polymeric nanoparticles . The cellular uptake efficiency of the fluorescent coumarin 6-loaded-nanoparticles by MCF-7 TAX30 cells was assayed upon 2 h incubation, and the results are shown in Fig. 5. It can be clearly observed that for both formulations, the cellular uptake efficiency of nanoparticles by MCF-7 TAX30 cells (Fig. 4) was found decreased with increase of the incubated particle concentration from 100 to 500 μg/ml, indicating the saturated and limited capability of cellular uptake of the nanoparticles. Such saturated and limited characteristic of cellular uptake of particles was also observed by others [27, 28]. The cellular uptake efficiency of PCL/Pluronic F68 nanoparticles was 1.47-, 1.36-, and 1.67-fold higher than that of PCL nanoparticles at the incubated particle concentration of 100, 250, and 500 μg/ml, respectively. As shown in Table 1, the coumarin-6-loaded nanoparticles were highly relevant to the docetaxel-loaded nanoparticles in terms of size and zeta potential. Harush-Frenkel et al. found that both cationic and anionic nanoparticles are targeted mainly to the clathrin endocytic machinery. A fraction of both nanoparticle formulations is suspected to internalize through a macropinocytosis-dependent pathway. A significant amount of nanoparticles transcytose accumulate at the basolateral membrane. Some anionic but not cationic nanoparticles transited through the degradative lysosomal pathway. Pluronic block copolymers could enhance cellular uptake of drugs, proteins or polynucleotides [15, 30]. In addition, it was demonstrated that the mechanism of cellular uptake of biodegradable microparticles or nanoparticles is size dependent [2, 31]. Thus, it is reasonable that PCL/Pluronic F68 nanoparticles with incorporation of Pluronics and smaller particle size would have higher cellular uptake. Figure 6shows the confocal laser scanning microscopy (CLSM) images of MCF-7 TAX30 cells after 2 h incubation with coumarin-6-loaded PCL/Pluronic F68 nanoparticles at 250 μg/mL nanoparticle concentration, in which the upper left image was obtained from FITC channel (green), the lower left one was from propidium iodide (PI) channel (red), the upper right image was from transmitted light channel (black and white), and the lower right image was the combination of all the three images. We can see from this figure that the fluorescence of the coumarin-6-loaded PCL/Pluronic F68 nanoparticles (green) is closely located around the nuclei (red, stained by PI), which indicates that the nanoparticles have been internalized by the cells. Figure 7 shows the in vitro viability of MCF TAX30 cells cultured with the drug formulated in Taxotere®, PCL/Pluronic F68 nanoparticles, and PCL nanoparticles at the same equivalent docetaxel concentration of 0.025, 0.25, 2.5, 10, and 25 μg/mL and empty PCL/Pluronic F68 (PCL/F68) nanoparticles with the same nanoparticle concentrations of 0.25, 2.5, 25, 100, and 250 μg/ml, respectively (n = 6). 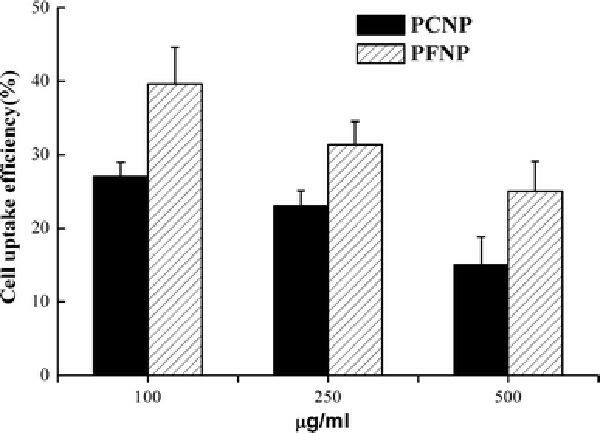 It can be seen from this figure that in general (1) the drug formulated in PCL nanoparticles showed equivalent or better effects against the cancer cells than Taxotere® and (2) PCL/Pluronic F68 nanoparticles achieved even better therapeutic effect than PCL nanoparticles and Taxotere®. For example, the MCF-7 TAX30 cell viability after 1 day incubation at the 10 μg/mL drug concentration was decreased from 54.37% for Taxotere® to 49.16% (i.e. a 11.42% increase in cytotoxicity, p > 0.05) for PCL NP formulation and 36.63% (i.e. a 38.88% increase in cytotoxicity, p < 0.05) for PCL/Pluronic F68 NP formulation. Similarly, it can be evaluated from Fig. 7 that compared with commercial Taxotere®, the cytotoxicity of MCF-7 TAX30 cells was increased 5.07% (p > 0.05) and 9.31% (p > 0.05) for the PCL NP formulation, and 42.37% (p < 0.05) and 38.32% (p < 0.05) for PCL/Pluronic F68 NP formulation after 2 and 3 day incubation at the 10 μg/mL drug concentration, respectively. However, the empty PCL/Pluronic F68 nanoparticles had no significant influence on cell viability of MCF TAX30 cells. The higher cytotoxicity of the drug formulated in the two nanoparticle formulations can be attributed to the higher cellular uptake as well as the sustained drug release manner in comparison with Taxotere®. In addition, nanoparticles could reduce the multidrug resistance (MDR) that characterizes many anticancer drugs, including docetaxel, by a mechanism of internalization of the drug , reducing its efflux from cells mediated by the P-glycoprotein . The reason of the advantage of PCL/Pluronic F68 nanoparticles over PCL nanoparticles may be attributed to the higher cellular uptake of the nanoparticles as well as the faster drug release from the nanoparticles, which was shown before in Fig. 4. More importantly, Pluronics could cause drastic sensitization of MDR tumors to various anticancer agents including docetaxel [12, 14]. The mechanisms of Pluronic effects in MDR cells were thoroughly investigated. It was demonstrated that Pluronic block copolymers could (1) incorporate into membranes changing its microviscosity; (2) induce a dramatic reduction in ATP levels in cancer and barrier cells; (3) inhibit drug efflux transporters, such as P-gp [14, 32], breast cancer resistance protein  and multidrug resistance proteins ; (4) induce release of cytochrome C and increase of reactive oxygen species levels in the cytoplasm ; (5) enhance proapoptotic signaling and decreasing antiapoptotic defense in MDR cells ; (6) inhibit the glutathione/glutathione S-transferase detoxification system ; and (7) abolish drug sequestration within cytoplasmic vesicles . The key attribute for the biological activity of Pluronics is their ability to incorporate into membranes followed by subsequent translocation into the cells and affecting various cellular functions, such as mitochondrial respiration, ATP synthesis, activity of drug efflux transporters, apoptotic signal transduction, and gene expression . Moreover, recent studies indicated that Pluronic F68 is a potent in vitro inhibitor of both P-gp and CYP3A4 . Other similar drug carrier such as mPEG-PCL copolymer  and n-(2-hydroxypropyl)methacrylamide (HPMA) copolymer  could also overcome the multidrug resistance of cancer cells. The in vitro therapeutic effects of a dosage form can be quantitatively evaluated by its IC50, which is defined as the drug concentration at which 50% of the cells in culture have been killed in a designated time period. Table 2gives the IC50value of MCF-7 TAX 30 cells after 24-, 48-, and 72-h incubation with docetaxel formulated in Taxotere®, PCL, and PCL/Pluronic F68 nanoparticles at various drug concentrations, respectively. The data are impressive to show the advantage of the nanoparticle formulation versus the pristine drug as well as that of PCL/Pluronic F68 nanoparticles versus the PCL nanoparticles in docetaxel formulation. It can be found from Table 2that the IC50value for MCF-7 TAX30 cells was decreased from 10.380, 8.726, and 5.945 μg/mL for Taxotere®to 7.388, 3.643, and 1.244 μg/mL for PCL NP formulation and to 1.019, 0.384, and 0.196 μg/mL for PCL/Pluronic F68 NP formulation after 24, 48, and 72 h incubation, respectively. Such advantages of the NP formulations in achieving higher cytotoxicity would become even more significant if the controlled release manner of the drug from the nanoparticles is further considered. It can be seen from Fig. 4that the accumulative drug release was only 13.57, 20.61, and 27.94% for PCL nanoparticles and 22.40, 31.09, and 37.44% for PCL/Pluronic F68 nanoparticles after 1, 2, and 3 days, respectively, and the release started from 0% while the Taxotere®immediately became 100% available for the MCF-7 TAX30 cells in culture. For the first time, a novel docetaxel-loaded PCL/Pluronic F68 nanoparticle formulation was prepared to overcome multidrug resistance in human breast cancer cells. The results revealed that there was an increased level of uptake of PCL/Pluronic F68 nanoparticles in docetaxel-resistance human breast cancer cell line, MCF-7 TAX30, when compared with PCL nanoparticles. The cytotoxicity of PCL nanoparticles was higher than commercial Taxotere®in the MCF-7 TAX30 cell culture, but the differences were not significant (p > 0.05). However, the PCL/Pluronic F68 nanoparticles achieved significantly higher level of cytotoxicity than both of PCL nanoparticles and Taxotere®(p < 0.05), indicating docetaxel-loaded PCL/Pluronic F68 nanoparticles could overcome multidrug resistance in human breast cancer cells and therefore have considerable potential for treatment of breast cancer. The authors are grateful for financial support from the National Natural Science Foundation of China (NSFC) under Grant No 30500239 and the Shenzhen Municipal Government and Bureau of Science, Technology & Information for providing funding supports (to LQH) through the programs of Shenzhen National Key Lab of Health Science and Technology and the Key Lab of Gene and Antibody Therapy.